Harmonic minor scale, plus natural and melodic minor scale, FREE download. 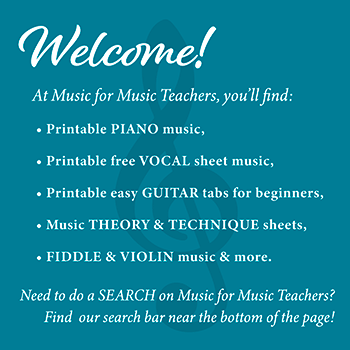 Print out one-octave and two-octave scales, I, IV and V chords, tonic chord inversions and arpeggios, all on one sheet for each of the 12 minor keys! As a child, I always loved the minor keys the most. I guess I still do. Of all the scales, the harmonic minor scale was my favorite, because it seemed to contain magic within its sounds... magic that could carry me away to other lands in my imagination. My students started to really enjoy their scales, chord inversions and arpeggios when we made a contest out of the process... a contest between them and the metronome. It gives them a goal, a measurable mark of progress. They can feel the skill of their hands growing. Question: I have 1 small question... In your 1-4-5 progression on Minor scales, there is i, iv and V (minor,minor, major). Shouldn't the V (major) also be a v (minor)? Reply: That is a very good question. It is the difference between the sound of a NATURAL MINOR scale and a HARMONIC MINOR scale that you are seeing. Ordinarily, in Western music, when we go to the V chord, even in minor, we preserve the raised 7th step of the scale in order to "lead" the progression back home to the I or i chord. It is the half step between the 7th & 8th (1st or tonic) steps of the scale that are important. So usually that chord is altered, so that we hear that "leading tone", step 7 of the minor scale, even when the other chords stay minor. Say you're doing an Am arpeggio... break it up into segments. Start hands separate, even if they can easily do hands together arpeggios. Set the metronome for 60 or so (about 3 times the speed of 200, or a little less). Listen to the metronome go "Tic -- Tic -- Tic" while you say "1-2-3, 1-2-3, 1-2-3," each "1" coordinated with a tic, waiting to "jump" in like a child jumping rope. Then jump in, playing just one octave, making the A's match the metronome. "A-c-e-A!" (Tic-2-3, Tic-2-3) "A-2-3-A!" Then try two octaves. Then backwards. Doing the arpeggios in "chunks" like this will give them another practice technique for their "toolbag". I hope you find the harmonic minor scale and other piano scales and chords useful in your music studio. While understanding the method of building them is what's most important, it is also helpful for students to know what they look like. For you as a teacher, sheets like these save time and expedite assignment-making.